In the beginning, it was my father who lit the match. My father who planted the seed. My father who signed me up for a lifetime of fanatical devotion to a team synonymous (until this weekend, at least) with agonising failure. He always told me how, as a boy, he cycled to Charlestown to see the great Seán Flanagan line out for Mayo. Flanagan was the last Mayoman to raise the Sam Maguire, captaining the county to consecutive All- Ireland titles in 1950 and 1951. He described how Flanagan once, felled by a heavy tackle, had kicked a point from his hands, over his shoulders, while lying on his back. As a child, I would slump back in the grass outside, with a football in my hands, staring up at the sky, wondering how in the hell he’d managed it. My first championship game was the 1984 Connacht final between Mayo and Galway. I was five years old. And as long as I’ve been in Ireland, I haven’t missed one since. Our local butcher, Micheál Webb from Ballyhaunis, was in goal for Mayo that day. Even before the throw-in, his practice kicks out soared many times farther and higher than I imagined a ball could be kicked. The man became a giant to me and yet he still lived at the end of our road. That, in essence, is the magic of the GAA. Mayo lost that Connacht final, but better days were always a-comin’. Victory over Tyrone in the 1989 All-Ireland semi-final was one of the sweetest: Liam McHale rising to catch the ball with one hand, Willie Joe Padden – the Aidan O’Shea of his day, you might say – turning in one of the greatest performances of a storied career. That iconic image of Willie Joe, battered but unbowed, became so famous in Mayo that younger fans were often disappointed subsequently, when he didn’t take to the field with that bloodied bandage still wrapped around his head. On the final whistle, in a moment of unpremeditated abandon, I scaled the Croke Park barriers and sprinted out into the promised land beyond. As tends to happen, a couple of thousand other geniuses had the very same idea. I soon found myself lost, alone, paralysed with fear and desperately seeking out a familiar face. That experience became something of a recurring nightmare for successive Mayo teams in Croke Park in the decades to come. Yet through those years, I’ve learned a thing or two from supporting Gaelic football’s most famously unsuccessful team. The night before the 1989 final, we stayed with my uncle George in Ballinteer. The next day, before we left for the game, he told my aunt Monica he’d be home at 5.30 that evening. Unless Mayo won, he added (matter-of-factly), in which case she could expect him home in approximately three-four weeks. That three-point defeat to Cork became the first of seven All-Ireland finals (including one replay) we would contest without victory in the intervening years. God alone knows what will happen if we win on Sunday. Often on crowded Connacht terraces in the early 1990s, my sister and I would not have the luxury of a direct line of sight on to action taking place on the field of play. As kids, we learned to gauge how well or otherwise Mayo were faring based on the volume and tenor of our adult relatives’ cheers (and curses). In the twilight of Willie Joe Padden’s career, however, that system fell asunder whenever the great man was introduced as a late sub. All Willie Joe had to do was catch a ball and the crowd’s reaction would lead us to believe Mayo had scored a goal. If he kicked a point, well, you might deduce the stadium was collapsing. During Mayo’s calamitous defeat to Leitrim in 1994, Liam McHale endured abuse from his own fans that was so vicious and unwarranted I’m amazed he didn’t turn his back on the county set-up there and then. In truth, he’d probably been our best player that day in Dr Hyde Park. His real offence, as far as I could tell, was he played basketball and had a suntan. In pre-Celtic Tiger Ireland, these qualities made him suspect in the eyes of some “traditional” supporters. Thankfully, his critics were ignored. Mayo lost consecutive All-Ireland finals, in 1996 and ’97. Yet when Galway raised Sam in ’98, we earnestly believed a major breakthrough for Connacht football was imminent. The following summer, I hitchhiked from Galway city (where I was a student) to Tuam on a miserable day for the first round of the Connacht championship. If I’d managed to locate my father and uncle George in the crowd, I’m sure they’d have stood me dinner and maybe even bought me a pint or two. But in that pre-mobile phone era, it wasn’t to be. Not that I cared anyway. Mayo swept Galway aside in an epic contest. And as I zipped up my jacket, and stashed my Mayo colours away for the return journey, I didn’t mind getting wet. That 1999 All-Ireland title, I knew, was already safely in the bag. If nothing else, the Mayo team of the mid-2000s was a product of that era: brilliant, brash and (in the end) swaggeringly overconfident. Where once Liam McHale was shunned for his suntan, this side sported bleached hair, white boots and designer mullets. Hell, Ciarán McDonald had cornrows – and no one even made fun of him for it! On this occasion, however, he said no. It really didn’t look like as if we would. That was the last game we ever attended together. He died unexpectedly that December. If condescending good wishes from neutral supporters decided All-Ireland finals, Mayo would be home and hosed. But they don’t. What we have instead – in players like Aidan O’Shea, Cillian O’Connor and Keith Higgins (who trained under my father as an U10) – is one of the most ruthless and clinical Mayo sides ever assembled. As for the supporters? We’re nothing if not biddable! Should we dial down the hype? Dial it back up again? Turn Croke Park into a cauldron of noise? Surf the internet on our phones for 70 minutes? Whatever we’re told to do, we’ll do. We just want to win this. My uncle George says this is the year. My mother has my father’s grave decked out in red and green. Friends of mine living abroad, with no chance of securing tickets, are flying home nonetheless. No county could possibly want this more. And yet, no county is better equipped to deal with falling short. Whatever happens, we’ll be back next year. We always are. As the late Ted Kennedy once said, the cause endures, the hope still lives and the dream will never die. 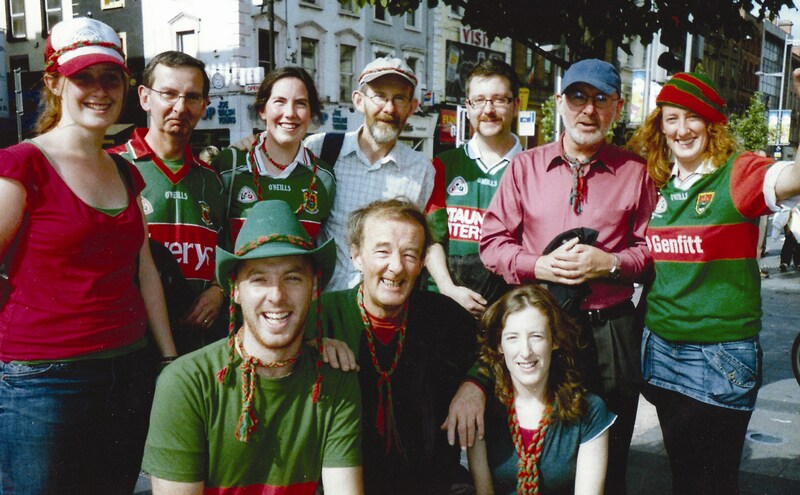 Back row: Josie, George, Nora, Fintan, Neal, Shane, Clare. Front: Eoin, Barry (my father), Una. I greatly enjoyed your article which brought back so many memories including the visit to St Geralds, Castlebar of the victorious Eamon Mongey, Paddy Prendergast and Mickey ‘The Flyer! Flanagan in 1950/51. To celebrate my happy childhood in the west, I have written a historical novel, “Spellbound by Sibella,” based on real events in 18th century Mayo. It has been published by Club Lighthouse CLP in Edmonton, Alberta, Canada and is now up on Amazon.co.uk. I could send you a copy if you were interested in reviewing it if I haven’t lost the run of myself.